1. Retail rebound: The US Census Bureau will release retail sales figures for April at 8:30 a.m. ET on Tuesday. Morgan Stanley analysts are expecting a rebound in consumer spending in the second quarter, led by an increase in sales at home improvement stores. Retailers have been suffering in recent quarters, partly because of lukewarm wage growth. Despite a healthy job market, wages rose 2.6% from a year ago in April, following 2.7% growth in March. Most experts think that number needs to be above 3% before consumers will start spending more. 2. Vodafone CEO to quit: Shares in Vodafone (VOD) opened almost 4% lower in London on Tuesday, after long time CEO Vittorio Colao said he would step down in October. Colao, who's held the role since 2008, will be replaced by Vodafone's chief financial officer Nick Read. Vodafone announced last week it was buying Liberty Global's operations in Germany, the Czech Republic, Hungary and Romania, significantly increasing its footprint in the region. Vodafone is paying €10.8 billion ($12.8 billion) in cash for the businesses. 3. China trade talks: A Chinese delegation led by President Xi Jinping's top economic adviser is visiting the United States from Tuesday through Saturday for trade talks. The negotiations are aimed at dialing down tensions between the world's two biggest economies. While Liu is in Washington, American companies will be airing their views on President Donald Trump's plan to slap tariffs on around $50 billion worth of Chinese goods as punishment for alleged intellectual property theft. The US Trade Representative will hear from more than 100 businesses and trade groups starting Tuesday. 4. German slowdown: Germany's economic growth slowed to 0.3% quarter on quarter in the first three months of the year, from 0.6% the previous quarter. Economists were expecting growth of 0.4% in Europe's biggest economy. The German statistics office said domestic demand, construction and manufacturing were stronger, while foreign trade was "less dynamic." The wider eurozone posted growth of 0.4% in the first quarter, down from 0.7% in the last quarter of 2017. 5. Global market overview: US stock futures were pointing lower early on Tuesday, indicating the Dow Jones industrial average longest winning streak since September might come to an end. 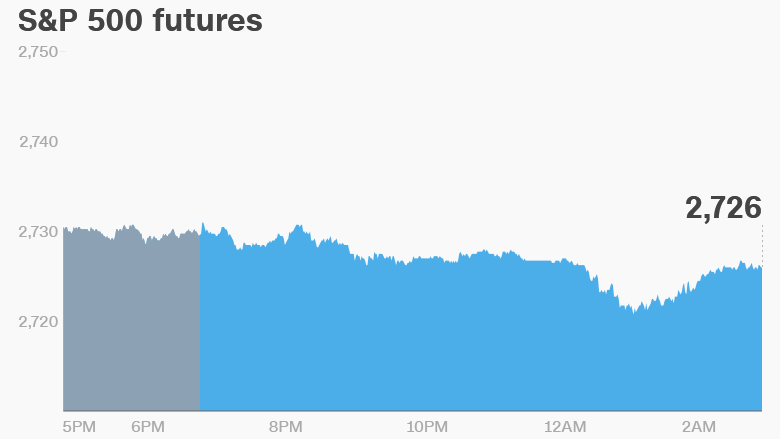 The Dow gained 0.3% on Monday, while the S&P 500 and the Nasdaq were both up 0.1%. European and Asian markets were mixed on Tuesday. 6. Earnings and economics: Home Depot (HD) is set to release earnings before the open Tuesday. UK unemployment was unchanged at 4.2% in the three months to March, matching the lowest it has been since 1975. Average wages excluding bonuses rose by 2.9%, up from 2.8% in the three months to February.